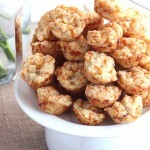 These bite sized savory cheese and bacon muffins are packed with flavor. Perfect for breakfast, brunch, or snacking in between. In a large mixing bowl, combine flour, baking powder, cheese, bacon, chives, salt and pepper. In a separate bowl, combine melted butter, sour cream, and milk. Combine wet ingredients with dry ingredients. Batter will be thick. Spoon batter into a greased mini muffin pan. Bake for 15-20 minutes until muffins are golden and a toothpick inserted near the center comes out clean.